I bet you thought I'd gone for good this time. Nope. Not yet. I figured that I write on average about 1,500 words a day for work, which, although not a grueling pace, is still quite a few words to write. Lately, I haven't had too many left. I have been mulling around the idea of destination. More accurately, I'm thinking about what can be discovered on the way. When our children were little, and we were making regular road trips to visit the grandparents, the Mister and I would routinely have a little debate about taking the back roads for at least part of each trip. I was having none. of. that. I insisted on our fine Interstate Highway System. I identified specific Chic Fil As and Cracker Barrels as acceptable places to stop to eat. When you are traveling with small children, you want clean restrooms and familiar food, in that order. Where's your sense of adventure? the Mister would ask. 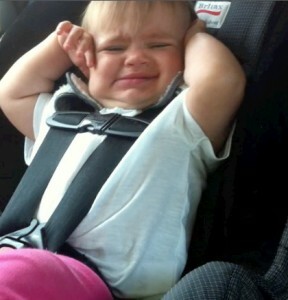 Listen, Bud, I've got all the adventure I need sitting right behind me in car seats. We can take the back roads when we're old. We're traveling on back roads more and more frequently these days. I like it. It's not the fastest, and, honestly, sometimes it's not the best, but it's where the stories are. A few months ago, the Mister and I were headed to the mountains for a weekend with friends. The rain poured and drizzled and spat both days, and we had a marvelous time, talking by the fire, walking in the woods, antiquing, and, of course, breaking bread together. The wonder of that weekend, though, actually began on the way, when the Mister and I decided to take a different route, off the beaten path. Instead of taking I-26 straight up the mountain from the outside of Greenville to Asheville (admittedly, we aren't exactly on the Beltway, here), we headed north via a small town named Travelers Rest, South Carolina. Its name is far more quaint than its history. Tucked into the picturesque region known as South Carolina's "Dark Corner," the little burg was known for the drunken duels between the "drovers" who--on horseback--drove the cattle and pigs to market in either Greenville or Asheville. Later, the area became infamous for its moonshine making and the kind of high-spirited antics that accompany that particular line of work. Its reputation grew as a mean place, which I thought was a shame since it had such a nice name. I'm happy to report that things are looking up in Travelers Rest. Not too many years ago, that modern miracle known as the public-private partnership took place, and the bankers and the bureaucrats and the conservationists got together with the Greenville Hospital System and, under the auspices of the Rails to Trails program, put together one of the topnotch cycling-walking-running trails in the country, and it's still growing, and guess what? It goes right through Travelers Rest, and all those cyclists and walkers and runners stop and eat lunch and shop. And I suspect some of them started coming back for dinner. And a few of them even started buying property for weekend getaways. And Travelers Rest widened its Main Street and planted flowers and bricked its crosswalks, and more people came, and more restaurants and shops opened. And, well. So, the Mister and I stopped for lunch. The cold January rain was pouring down, pouring. It was after two, and the restaurant we were aiming for looked dark. No cars in the lot, and it goes without saying that the bike racks were empty. The Mister pushed on the old door, and, surprisingly, it gave, and in we walked to the Cafe at Williams Hardware, which is the name of the restaurant, which is named after the building that houses it. Y'all open? the Mister calls out in his best Southern drawl, which is a stretch for him. Poor thing. We sure are, hon. Come on in out of that rain. Now, naturally, we are the only fools, er, patrons out on a cold January, looking for lunch at almost three o'clock, but our hostess welcomes us with a warm smile. She advises us of the specials as we drip on the timeworn heart pine floors. We decide on the BLT and broccoli salad. She seats us by a window that looks out on the aforementioned trail and a spacious screened porch for warm weather dining. She pours some coffee, and she stays to chat for a minute about the weather, about the cafe (she and her sister own it), about the food (fresh, locally sourced, people won't have it any other way, and they shouldn't), about the roads and where the cell phone service cuts out in the gorges (y'all be careful), and then, as in the South, it often does, the topic veered off onto where we live, where we went to school, and that's where she went to school, and I bet y'all know ___, and, of course, we don't know her personally, but we know her cousin) and that's when the plates arrive, and they are fine. The bacon is as thick as a pork chop, and the lettuce is crisp, the avocado is mellow, and the homemade mayonnaise is lemon-y and smooth. Of course, we noticed the dessert counter on the way to our table. In-house, homemade cakes--red velvet, chocolate, caramel, hummingbird, and some sort of berry-goat cheese tart, which I might've ordered if it hadn't been raining so hard. We split the caramel. And we had another cup of coffee. It was growing dark, and we had an hour's drive through the mountains left. We hated to leave, but we'll stop in again. We said we'd be on bikes or foot the next time, so we need to make good on that promise. If you happen to be barreling down I-26, somewhere near Asheville, don't be shy about getting off the Interstate, and exploring some of the beautiful back roads. 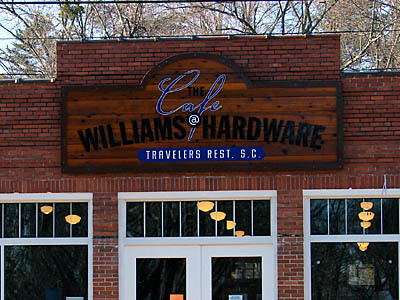 And, if you're anywhere near Travelers Rest, then by all means do stop and sit a spell at the Cafe at Williams Hardware. I bet the porch is open now. Oh lovely. I've been dreaming for ages of a road trip through the South. Your post spells out exactly why. Glad you gave us some words too. What a delight to find your blog this afternoon. I love the 'off the beaten path' for travel, but I also remember what it was like traveling with small children ( many years ago). I am off to read more. Had a wonderful breakfast at the cafe just this morning and yes the porch is open. 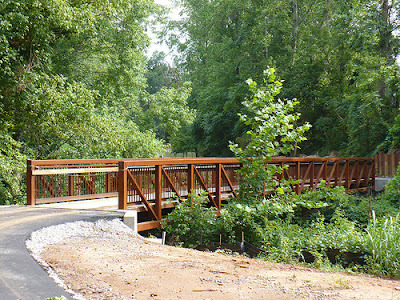 What a great piece on our little city and trail. It is a great place to live...and eat. We drove from Atlanta to Ashville on back roads when we went to the Biltmore House last year and there were so many cute towns, but of course we didn't stop. We came home via the interstate and it sure wasn't as much fun! Come by my blog and enter my one and only blog giveaway. I'm trying to be better about writing something interesting!